French prosecutors have opened an investigation after two helicopters crashed in Argentina, killing eight French nationals, including three sports stars. The collision also claimed the lives of the two Argentine pilots. President Francois Hollande said it was “a cause of immense sadness”. Both helicopters were involved in the filming of TV survival show Dropped, which airs on French channel TF1. On Dropped, celebrities are flown into rough terrain and filmed while they attempt to find food and shelter. Other contestants were standing on the ground blindfolded a few hundred meters away when the accident happened near Villa Castelli in La Rioja province, French media said. The five other French nationals killed were said to have worked for Adventure Line Productions (ALP), the company making the show. They were named as Laurent Sbasnik, Lucie Mei-Dalby, Volodia Guinard, Brice Guilbert and Edouard Gilles. The Argentine pilots were named as Juan Carlos Castillo and Roberto Abate. Emergency workers had removed all of the bodies from the wreckage by Tuesday afternoon. Local authorities said they were being taken to a morgue in the capital of La Rioja province, about 200 miles from the crash site. The cause of the crash is as yet unclear and investigations are under way. The inquiry in France is standard procedure when its nationals die overseas. President Francois Hollande is sending two investigators and two aeronautical advisors to Argentina to assist in finding out what went wrong. Tributes have poured in to the dead stars from France and beyond. “We are shocked by this sad news,” said Thomas Bach, President of the International Olympic Committee. “The world of sport and the Olympic family have lost three of their key members,” he said, calling them champions and role models. 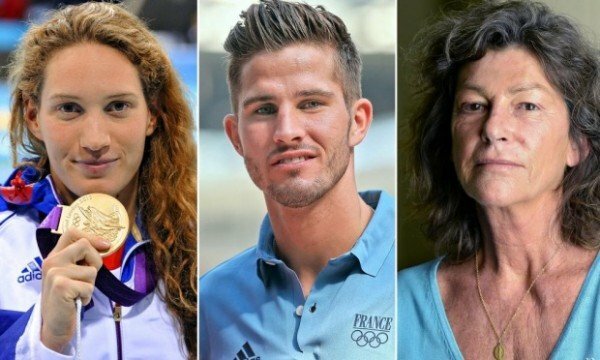 Camille Muffat’s boyfriend, William Forgues, said she was often called “Miss 100%” because “she won everything”. “She went on this trip so happy. It was her choice to be there,” he told reporters. Filming for Dropped began late last month at Ushuaia in the deep south of Argentina and had since moved to the mountainous western province of Rioja. One cast member, figure skater Philippe Candeloro, was said to be “extremely shocked but unharmed”. The death of the three sports stars and five other French nationals was splashed across every paper, every news bulletin. French PM Manuel Valls tweeted his “immense sadness” saying “all France is grieving this morning”. Meanwhile Culture Minister Fleur Pellerin told the BFM-TV news channel that the three athletes were “among the most outstanding ambassadors for our country”. Well-known musician Benjamin Bioley has criticized what he called a “horrible TV reality show that serves up cardboard stars and then steals three wonderful athletes”. Officials have said the weather conditions in the mountainous area where the helicopters went down were good. TF1 said it had postponed the show and the rest of the crew were returning home. “All TF1 teams come together in this terrible time with the pain of the families and relatives of the victims,” the broadcaster said in a statement.